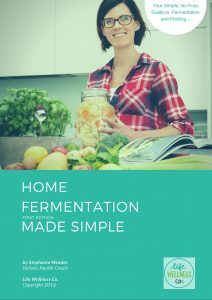 eBooks – Life Wellness Co.
‘Home Fermentation…..Made Simple’ is your one stop shop for home fermentation and pickling techniques including heaps of delicious recipes to get you on your way fermenting like a pro. Learn how to create delicious and nutritious homemade ferments simply and affordably with this no fuss guide to home fermentation and pickling. Including classic ferments such as purple sauerkraut, ginger and turmeric sauerkraut, kimchi and white sauerkraut with caraway seeds. Chillies, cucumbers, beetroot, fermented garlic and mustard….just to name a few of the classic pickling recipes included in this book. Learn how to transition your family to a ‘Real Food’ way of life through learning what ‘real food’ is, why it is so important for our kids, where to buy it to save money, how to prepare it, what to look for in the supermarket (food labelling), and most importantly how to make meals and snacks your family will love. 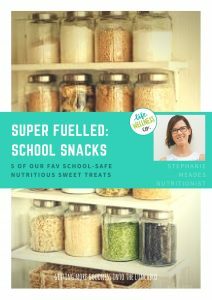 Find heaps of breakfast, lunch, dinner, snack, dessert and drink recipes that your family will love. Classic family dinners like spaghetti bolognaise, beer burgers, butter chicken, salmon patties and burritos are made healthy using real food ingredients. Classic desserts like ice cream, mousse and even homemade chocolate….just to name a few. 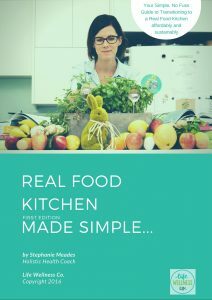 ‘Real Food Kitchen…Made Simple’ is your guide to transitioning your kitchen from being dominated by unhealthful processed, packaged foods to a kitchen filled with nutritious real food ingredients ready to nourish and support your health and wellbeing. The book covers what real food is, why we want to be eating it, what we need to avoid and common consumer traps in our supermarkets, where to shop for real food ingredients, how to save money and time whilst transitioning to a real food kitchen and loads and loads of real food recipes to show you how easy it is to use these ingredients to make simple, quick and nutritious recipes for your whole family. 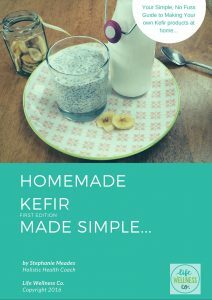 This book will save you so much money…1 litre of homemade kefir will cost you no more than $2.00 to make, yet to buy it will cost you at least $12.00 at your local co-op. That will add up for all those wanting to start taking kefir on a daily basis to improve their gut health. Learn the basics of how to make your own kefir including recommendations on the equipment and utensils required and how to modify your technique for non-dairy version of this probiotic gem. Also included in this book are simple recipes to assist you make your own yoghurt, sour cream, cream cheese, ice cream and preserving brine. 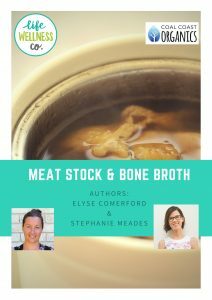 Meat stocks and bone broth are the basis for repairing gut health and are so versatile in the kitchen. Learning how to make this nutritional power house is super simple with this step by step guide including all the important info on the best types of meat, what to expect while it is cooking and some great ideas on how to integrate broth into your daily diet. 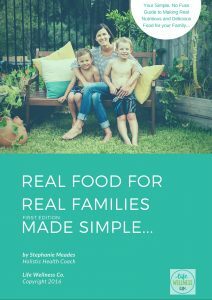 Based on our hugely popular workshops, this ebook is packed with great recipes and ideas to keep little tummies happy- without the sugar crash. We all know what we feed our children has a huge impact on their behaviour and ability to learn- but getting them to enjoy healthy options can be troublesome. These recipes are simple enough to get the kids into the kitchen, but more importantly, they will love to eat them. Ready to start adding this healthy fat into your diet and wondering where to buy ghee? Want to stop spending huge amounts of money on super nutritious but expensive ghee? Making ghee is a beautifully simple process but cdan be tricky if you don’t know what to look for. 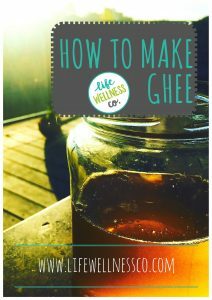 This step by step guide will talk you through the process- ensuring your ghee is clear and nutty. Ghee is a very versatile ingredient, and there are a multitude of potential ghee uses. In fact, it can be used in place of just about any other cooking oil or fat. Try swapping it in place of butter, vegetable oil or coconut oil in your favorite recipes to add a burst of flavor and get all the wonderful ghee benefits.